My kids are so big now it’s like I don’t have kids at all. In some ways, with me being sick all the time, they seem like they have reversed roles on me. Sometimes when I haven’t gotten out of bed all day, one of my boys will bring me something to eat because they are worried about me. My younger son, Riley, especially worries about me not drinking enough water. I always have a bottle of water with me and one in the frig… but if my fibro acts up and I’m sleeping a really long time, Riley comes in with a nice cold bottle of water for me and reminds me that I need to drink it. He’s so thoughtful. He’s also a lot like his dad. He’s really grown up a lot in the past year. He’ll be 15 in January. He knows that we are tight on money now that I’m not working and he was trying to tell me he didn’t need new shoes because he was sure he had another pair somewhere. One of his shoes had a huge blow out……. There was a 5 inch long gaping hole where it separated from the sole. He looked at the prices and decided he didn’t really need new shoes. “There are lots of shoes in the garage,” he said….. but they are not likely to have grown like his feet have. We ended up getting size 11.5 which is 1 whole size bigger than what I bought him just this summer. There were no sales on shoes anywhere in town but there are just some things you have to have. I explained to him that he did need new shoes……. what we don’t need is chips, soda, gum, candy…. stuff like that. So, he used his own money to buy some candy and didn’t ask for anything at the grocery store. Earlier in the evening we had gone to a Poetry Slam at Riley’s school. 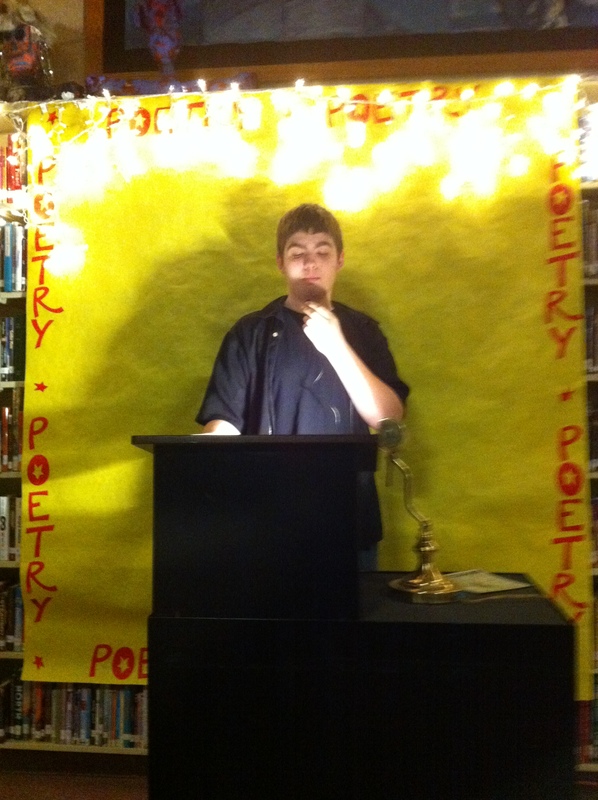 Anyone who participates in the poetry slam gets extra credit. Riley had asked me yesterday if I knew of a good poem and I read him several of my favorites. Riley then asks if I had a good one that I wrote. I searched my blog and read him a few that I wrote. He decided to read my poem called “Thank you” which drips with sarcasim. He did a great job reading it. I had explained how a lot of people get nervous and talk really fast so you can’t understand them. I also read the poem to him with expression so he had an idea how to do it. I was so proud of him because he read it so well and so clear! He also told everyone that his mom wrote the poem and pointed me out. Oh, I should add that we change the “D” word to “darn”. Now, I can’t leave out my other son who is a senior in high school this year. He’s so tall! He’s like a basketball player – only he doesn’t play basketball. 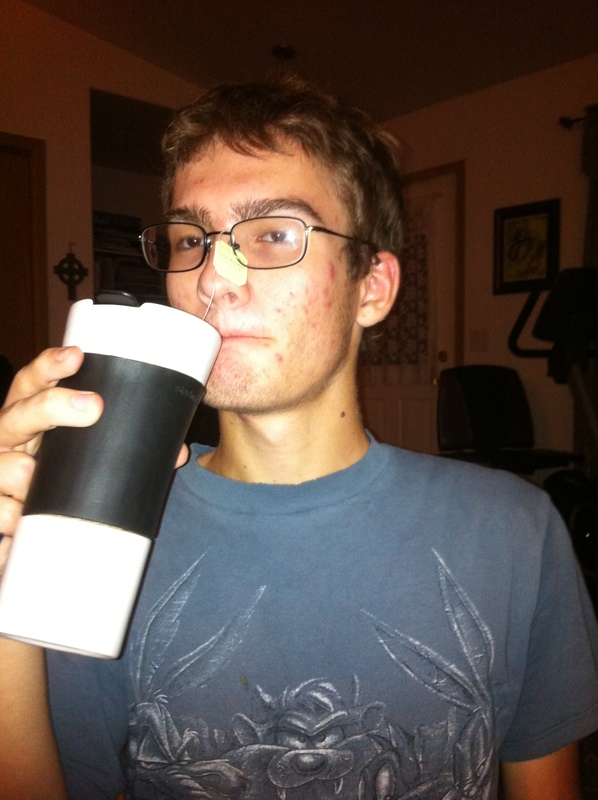 He is a computer geek/math wizard/book inhaler. This kid is my tech support and even can help his grandma with her computer over a long distance telephone call. He’s SCARY SMART! He likes music that I listened to when I was in high school and so every day when he gets home from school he turns on pandora and he both sing along with some good 80’s music LOL (sometimes older music too) He also likes to drink tea in the evenings with his mom and talks with me a little while. He can be pretty funny sometimes. Last night he somehow got the tea bag hung on his glasses! Okay, I better go to bed… I’m exhausted. I don’t really know how since I was in bed all day until about 6pm. Well, maybe tomorrow will be a good day.